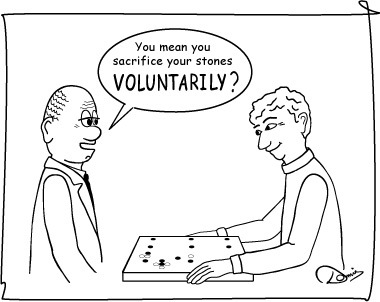 A sacrifice is the act of deliberately abandoning stones, either on a local or global scale. Such stones are called sacrifice stones. Locally, one may play a throw-in as a sacrifice to capture a whole group. See the throw-in page. Globally, one may abandon a whole group in order to gain the advantage elsewhere or in the surrounding area. This is typically done as an exchange. 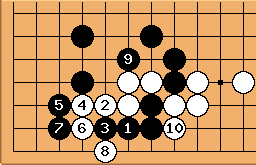 It is a big deal, especially in the middle game, to be able to distinguish between key stones, which for strategic reasons are not to be sacrificed (for example important cutting stones), and disposable stones, which will include some kikashi stones but are certainly not limited to those. See aspects of sacrifice for the various topics related to sacrifice. 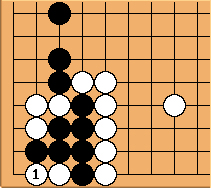 and is the sacrifice known as the two-stone edge squeeze, allowing black to win the capturing race. In this capturing race, is the only way to play. The result is a ko. 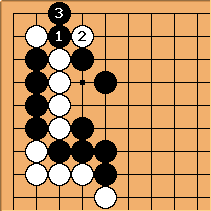 The purpose of and is not to win the capturing race, but to gain forcing moves at , , and , getting a strong outside wall in exchange for sacrificing additional stones. This example can be seen as an extension of the add a second stone and sacrifice both principle.